An important question at this point is, “Are some particles more damaging and/or helpful than others?” And the answer is indeed yes. What seems to cause the most problems of all is when there’s a lot of LDL-P. When I was in the earlier stages of the (very long) process of learning about everything we’re discussing in this blogpost, I presumed that VLDL particles would cause more problems than do LDL particles because they carry TG formed via de novo lipogenesis, but that’s not the case. It’s easy to make assumptions about cholesterol and lipoproteins, and boy howdy have a lot of assumptions been made, many of which just aren’t true. VLDL particles can be problematic, but there are far more LDL-P than VLDL-P. It’s more about the number of LDL-P and less about the amount of cholesterol transported in the particles. It’s both, but the sheer number of particles matters most. As we’ll see, particle size also matters, but the number of particles matters more. Also, LDL particles tend to hang around in circulation a lot longer than do VLDL particles ( a day vs. a few hours). Maybe VLDL-P don’t live very long because all that TG and cholesterol clogs their little VLDL arteries and they develop VLDL health issues. Ahem. So it’s the LDL-P that seems to be the issue. High LDL-P is associated with risk, and low LDL-P is associated with health. But why? Why is a high number of LDL-P problematic, and even more importantly, how can we naturally reduce the number of LDL-P, and can we really, truly know that doing so is a good idea? You ask a lot of relevant questions. Answered in order: high LDL-P is problematic because when we have lots and lots of LDL-P, some of them pass between the endothelial cells and cause atherosclerosis. This occurs, in part, due to the large numbers of LDL-P per se. Why is that? Because they happen to be just about the right size to do so; when there are large concentrations of them, they seem to have a greater capacity for winding up in places they’re not intended to be. Mind you, there’s a lot of size variability in all the lipoprotein particles—HDL, LDL and VLDL all vary greatly in size based on innumerable influences. We’re going to digress into atherosclerosis and then we’ll get around to how to naturally lower the number of LDL-P and why it’s a good thing when that happens. Atherosclerosis is what happens when a whole bunch of LDL particles within a certain size range work their way between and in back of the endothelial layer and can’t get free. If the body could just bring a tow truck to the scene of the accident, free the shy little LDL particles and get them back into the bloodstream, all would be well. Alas, this isn’t possible, and so the body begins to dismantle the wee little particles, and when it dismantles them, the cholesterol is liberated, and this seems to result in many things, including an inflammatory response. By the way, atherosclerosis indisputably begins in early childhood. What we ate as children and what our children eat matters, and it matters a lot to future health and disease status. It’s a little odd to have to point out something so obvious, but the degree to which we’re in denial over the effects of what we eat on our children’s health is something I’d like to discuss with Freud. And with you, too. And while I’m pretty clear nowadays about what to and what not to eat (and why), I’ve been through many diets myself, including the proverbial see food diet. So I understand being in denial about the impact of diet on health from previous personal experience. What I didn’t know was just how damaging poor diet status was, nor did I know how early the negative effects of poor diet began to show up in our bodies. A nation-wide autopsy-based study of atherosclerosis in young Japanese (1 month-39 years) disclosed the presence of fatty streaks in 29% of aortas in those aged <1 year and in 3.1% of coronary arteries of children aged 1-9 years.5). Atherosclerosis begins in childhood as an accumulation of fatty streaks[:] lipid-engorged macrophages (foam cells) and T lymphocytes in the intima of the arteries. [Fatty streaks are the first visible signs of atherosclerosis that can actually be seen with the eyes.] Fatty streaks may or may not progress, and may regress. In some people, lipid accumulation is more pronounced with time, and the accumulated lipid becomes covered by a fibromuscular cap to form what is termed a fibrous plaque. Temporally, between the fatty streak and the fibrous plaque, transitional stages of atherosclerosis exist that are not identifiable by gross examination alone. With time, fibrous plaques enlarge and undergo calcification, hemorrhage, ulceration or rupture, and thrombosis. Thrombotic occlusion precipitates clinical disease such as myocardial infarction, stroke, or gangrene depending on which artery is affected. Something to keep in mind is that atherosclerosis and atherosclerotic-related issues kill more people than anything else; the first excerpt from the above research study indicates that it begins before our first birthday. Whoa. If that’s the case, it’s important to make lifestyle changes now to prevent it from being a problem both now and later. There’s a lot of technical jargon in the above paragraph, so I’ll translate it into more basic terms. 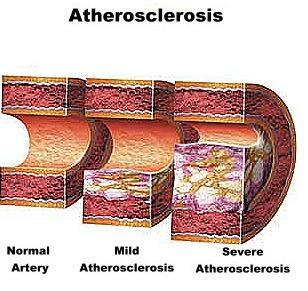 Atherosclerosis is a process that happens within the layers of the arterial wall. It’s not a blockage that forms within the opening (lumen) inside of the artery through which the blood passes. Keep in mind that apoB-containing particles pass into the arterial wall, i.e., the subendothelial space, and this initiates the process of atherosclerosis…inside of the arterial wall per se. This is only the beginning of the process. Without making this too complicated, we’ve mentioned that LDL-P are the main apoB particle that pass into the subendothelial space. While this seems to be the case, there are also oxidized LDL (OxLDL) particles that are even more atherosclerotic than the garden variety LDL-P. OxLDL is a deep subject that we don’t have to delve into, but it’s worth mentioning that some LDL particles become oxidized to varying degrees, and when they do, they convey an increasingly atherosclerotic risk. When an apoB (LDL-P or OxLDL) passes through the epithelial layer and becomes trapped in the subendothelial space, the process of atherosclerosis begins as a response to this situation and an attempt to heal it. When sufficient numbers of apoB deliver their cholesterol into the subendothelial space, an inflammatory response results. Said differently, ApoB particles initiate an inflammatory process that leads to frustrated attempts at healing. This, then, is where the misconception that the whole problem atherosclerosis has to do with cholesterol began in the first place: cholesterol becomes lodged in an arterial wall and all manner of problems ensue. You could argue that cholesterol is what’s causing the problem. Sure you could. But if you reduce LDL-P and metabolic syndrome indicators and BMI, the problem becomes (almost) a non-issue. Again, it’s not cholesterol, it’s the number of particles, especially the number of LDL particles. Rather than implicating cholesterol, we’ve got to have a look at what drives up LDL-P. LDL-P and atherosclerosis are symptoms, not problems per se. Addressing the symptoms and not the actual problem means the actual problem never gets addressed, and the problem therefore continues to exist, which uncovers the real double whammy of misdiagnosis: assuming the problem has been solved when it hasn’t allows it to continue to worsen. Further complicating matters is that when medications are given which mask both the symptoms and the problem without addressing it, we then assume that all is well when trouble continues to brew. As I’ve mentioned numerous times, the real issues are metabolic syndrome and NAFLD, and these problems are synonymous with high LDL-P, leptin and insulin resistance to name a few. Until we address the real problem, nothing much will change and atherosclerosis will remain a major health issue. Until you actually know what the problem is, you can’t solve the problem. I can’t stress this point enough: until you appreciate all the nuances of a situation, you can only misunderstand it. And when it comes to dealing with a patient and their health, misunderstanding must lead to misdiagnosing which inevitably leads to mistreating. Iatrogenesis—physician induced illness/complications—is the third leading cause of death in the U.S. Apprehending the problem as it actually is matters, and it matters this much. Why then, if this is the case, isn’t this information about particles (and the underlying causes of high LDL-P) front page news? It might surprise you to find that this information about LDL-P and its underlying causes has been known for a long time. It’s hardly new. The reality is that it takes a few decades—sometimes several decades—for change to occur in systems that are so multifaceted as is medicine. For example, here’s a link to a cited research publication from all the way back in 2000 in which all of this information is discussed. This is by no means the “best” research on the topic; I’ve included it because it demonstrates that as far back as 2000, this was clearly known. There are references to metabolic syndrome and NAFLD in JAMA (Journal of the American Medical Association) as far back as the 1980’s and metabolic syndrome was first discussed over 100 years ago. There are literally hundreds of studies just like this one; this information isn’t obscure, it just takes a long time to filter down through the ranks; the same goes for a lot of research that can similarly change your life. Just because it’s not popular doesn’t mean it’s not more accurate than what is. I’d be remiss not to mention another obvious point: there’s also a lot of money being made by giving people drugs for conditions that could be largely eradicated by changing things such as what’s necessary to reduce LDL-P, and it’s not actually all that hard. As I’ve written in other blogs, I’m not one much for conspiratorial thinking, but you’d be kidding yourself if you thought that the powers that be at the AMA don’t know every last bit of this information. Regardless, you now know this information, and therefore have the capacity to do something constructive with it. What’s more is that as I’m writing this—I’m currently on page 24—I just found out today that the AMA this week recommends that all patients with high cholesterol take statins, i.e., drugs that are designed to lower cholesterol, even though statins carry substantial and well-documented health risks. Statins happen to be far and away the most profitable drug in the U.S.—by a long shot. Coincidence? I’ll leave that up to you to decide, but to me it’s clear that dogma has overrun healthcare in pursuit of profit. No one is shocked when they learn these things, but it is disconcerting nonetheless. Tell Me How To Lower The Number Of Particles! How do you reduce the number of LDL-P? Simple. 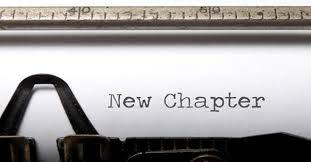 Change everything in your life that needs to be changed to lower LDL-P and don’t revert to your old ways. Yes, it’s a smart aleck thing to say, but you’d better believe that it’s the truth and the whole truth (wait—is there a difference between the truth and the whole truth? Who but a lawyer would ask such a question)? Okay…seriously…what changes do you need to make? Do things that improve your insulin and leptin sensitivity. That’s the answer. And deal with gut issues. Really? Really. Big time really. If it contributes to increased LDL-P, it’s probably going to contribute to metabolic syndrome and NAFLD as all of these, whether they’re lab values or conditions, tend to occur together. Okay, so how do I go about improving leptin and insulin sensitivity, and what is a gut issue and how do I heal that? Regarding leptin and insulin sensitivity, a very, very, very simplified answer is to match your energy intake to your metabolic demands. In other words, don’t take in more calories than you’re going to burn. Another answer would be to maximize your metabolic efficiency—to make more fuel while creating less waste. Another would be to optimize the macronutrients you ingest—get the right ratio of fats, proteins and carbohydrates figured out as exactingly as possible. Reduce stress. Reduce stress more. Now stop paying lip service to stress reduction and actually do it. This is probably the single most important thing you’ll ever do in regaining your health, by the way: reduce your stress level. If stress is blowing your health up and making it impossible to be healthy, it’s just not worth it. I’ve covered leptin and insulin in other blogs, so I’m not going to belabor the point here. I will, however, say that these bodies that we inhabit for a brief time don’t have to be so darned problematic as they are. Something that everyone comes round to recognizing if they’re deeply paying attention to their lives is that they cause their own problems. I’ve tested this out more than almost anyone I know, and have found it to be true that I indeed have caused every problem/stressor I’ve ever had. Things don’t just happen willy nilly and for no reason. And when it comes to cholesterol and atherosclerosis and stroke and huge numbers of particles and heart disease and so forth, we can’t ignore all the underlying contributing factors and expect things to change in a lasting way. There are numerous types of gut issues, and it’s well beyond what we can get into here. Suffice it to say that eating the wrong things and having too much of some gut bacteria and not enough of others (dysbiosis) causes insulin resistance. That’s correct: dysbiosis is synonymous with insulin resistance. This literally means that the results of your lipid profile are inseparable from your gut microbiota. Particle number. Leptin. Insulin. Sensitivity. Dietary choices. Stress. Gut health. Cholesterol. LDL, HDL, VLDL. De novo lipogenesis. Health. Longevity. Metabolic syndrome. Misinformation. What should you believe? I’ve learned a lot about these subjects, but don’t consider myself an expert. When it comes to cholesterol, HDL, LDL, etc., someone who is an expert is Thomas Dayspring, MD. Let’s have a look at what Dr. Dayspring has to say about these matters. Oh, and before we do, I’d better translate a few things or you’ll be scratching your head halfway through the first sentence. He’s going to mention some lipoproteins that I didn’t mention, e.g., Lp(a) (which happens to be a nasty little bugger, but I’m doing my best to spare you all the sordid details and stick to the main characters as much as possible). Here are a few phrases to know when reading the following by Dr. Dayspring. There are some parts that you may not understand, but read through to the bottom section where he lists out some points, and I think you’ll get the big idea of what we’re talking about and why LDL particle number is what this whole conversation is about. Depending on the technique used, the apoB (historically called beta) and apoA-I (historically called alpha) particles can be grouped into subparticles based on size or the presence of other apolipoproteins. The terminology can be complex and confusing, as there is no standard. To keep it simple, the apoB-containing lipoproteins are the potentially atherogenic particles and apoA-I particles are the presumed non-atherogenic particles (HDLs). ApoB (a collective measurement of how many chylomicrons, VLDLs, IDLs, LDLs and Lp(a) particles are in plasma), measurement of apoB has long been recognized as a far superior predictor of CHD [coronary heart disease] events than are any lipid concentrations including LDL-C. In several major studies elevations of the apoB/ApoA-I ratio has proved to be the best marker of CHD risk: such patients have too many atherogenic and too few non-atherogenic particles. size < 70 nm and endothelial integrity. LDL particles have a diameter in the range of 18-23 nm. Of these measurements (particle concentration and particle size), only particle concentration is statistically significantly related to atherosclerosis and clinical events[ bad things you don’t want like stroke and heart attack]. Particle size is important, but by itself has no statistical independency in any study (where both LDL-P and LDL-size were both measured) to predict events. Concentration of lipoproteins is referred to as quantity and lipoprotein size as quality. No one should be making diagnoses or risk assessment or judging therapy by looking only at lipoprotein sizes! In reality if you have concentration data, particle size is not that important. Put another way without concentration data, particle size cannot help you. Here’s a link to a video of Dr. Dayspring explaining the above information. It’s about the number of particles. It’s about a lot of things, but at the top of the list is particle number. As we begin to put this all together, theres another big point that we need to make about particle number and how it relates to risk/health status: concordance and discordance. All of these lab values we’ve been discussing, e.g., LDL, exist basically for one reason: their predictive capacity. For example, HDL has, for many years, been associated with healthy and happy, because when there’s high HDL, people are assumed to have less incidence of atherosclerosis, heart attack and so on. So HDL is a prognostic marker. The same has been said about LDL, only it’s usually prognostic of bad things to come. As a result, it’s been universally accepted in the healing arts that high HDL is good, LDL above certain thresholds is bad…and that’s about as far as anyone takes it. The point, however, is that HDL-C and LDL-C have long been used to predict risk status, but in and of themselves they don’t provide enough information to paint an accurate picture. Part of the challenge of considering LDL-P and HDL-P is that when they’re factored in, HDL-C and LDL-C cease to predict risk in the same way they do sans LDL-P and HDL-P. And this means that healthcare providers and patients alike have to unlearn what’s been drilled into their heads, i.e., that HDL-C and LDL-C predict risk status, and learn something not only new, but startlingly different. Most healthcare providers are unaware that HDL-C and LDL-C don’t accurately predict risk status per se, let alone about the information provided via LDL-P and HDL-P. 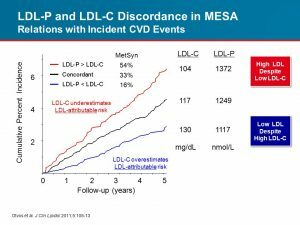 So: when LDL-P is factored into the equation, LDL-C and HDL-C suddenly become less predictive. Said in official jargon, they become discordant. Let’s have a look at a lovely chart that will show some rather surprising results, and will hopefully dislodge some of our misconceptions about LDL-C and HDL-C. This image is excerpted from the Multi-Ethnic Study of Atherosclerosis (MESA), and it shows some very interesting results when LDL-P is taken into consideration. The top (red) line on the graph above shows the greatest risk of CVD (cardiovascular disease). Fascinatingly, the greatest risk is associated with the lowest LDL-C of all three lines! That’s not a typo. The top/red line is also associated with the highest number of LDL-P, i.e., LDL particles. This is representative of discordant values, as LDL-C is lowest, yet was associated with the greatest risk. The middle (black) line shows concordant values, wherein the risk of CVD correlates with an increased LDL-C reading. The bottom (blue) line is discordant, as it has the highest LDL-C reading of all three lines, yet is associated with the lowest risk of CVD—and is associated with the lowest LDL-P. To be sure that the point isn’t missed: the lowest risk in the above study was associated with the highest concentration of LDL-C, i.e., LDL cholesterol concentration. It is therefore impossible to suggest that high LDL-C is bad, and anyone who makes such a suggestion is obviously misinformed. Also shown on this image from the MESA study is the association of metabolic syndrome (in the MetSyn column) with the red, black and blue lines. 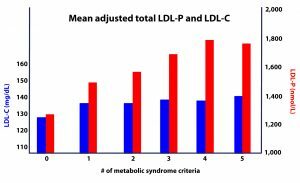 The red line, which represents what occurs when LDL-P > LDL-C, i.e., high particles and not high LDL-C, is associated with metabolic syndrome in 54% of the cases. Said differently, it’s not LDL-C that predicts metabolic syndrome, it’s high LDL-P. The black line, which demonstrates concordant values, is associated with metabolic syndrome at an incidence rate of 33%. The blue line—the line associated with the highest LDL-C but lowest LDL-P shows only a 16% incidence rate of metabolic syndrome. This clearly demonstrates that metabolic syndrome is associated with high LDL-P, but not with high LDL-C! I’ve covered metabolic syndrome in other blogs and mentioned it throughout this one. Briefly, it’s a collection of symptoms that are associated with an increased risk of CVD and other things you don’t want. Metabolic syndrome is preventable, providing you change the inputs that lead to it. Some of the symptoms include elevated blood pressure, dyslipidemia (when your HDL is low and your LDL is high—though we’re clearly seeing that this criteria is largely misunderstood), blood sugar dysregulation—hyperglycemia, hypoglycemia or both, insulin resistance, atherosclerotic changes and many other health issues as well. Metabolic syndrome is inseparable from non-alcoholic fatty liver disease (NAFLD), a condition in which healthy liver tissue is replaced by fatty tissue. It’s indistinguishable from alcohol-induced liver damage, and is caused by overfeeding of carbohydrates. NAFLD and metabolic syndrome are both associated with an increase of LDL-P, and both are predictive of CVD. Just because your LDL-P is high doesn’t automatically translate into having a heart attack or stroke, but it certainly does predispose you such adverse events. And just to be sure we’re getting the big idea: metabolic syndrome and NAFLD are not associated with elevated LDL-C, but with elevated LDL-P. Finally, metabolic syndrome and stress are inseparable; they’re not identical, but they’re tied at the hip. 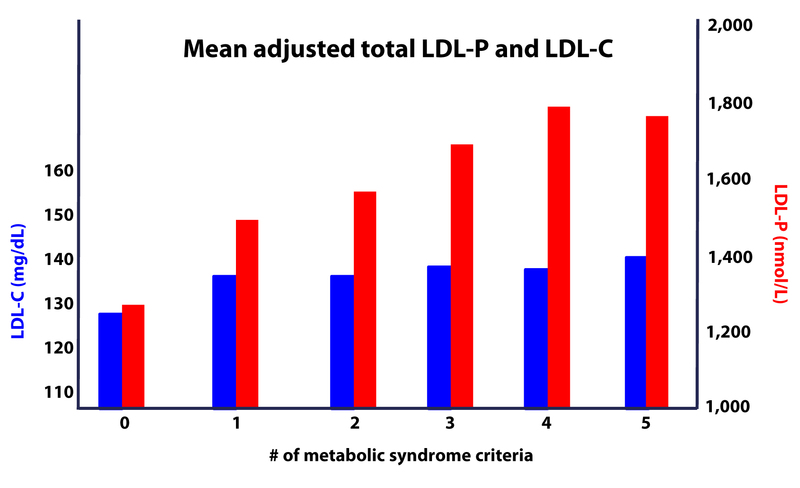 This chart shows as the number of metabolic syndrome criteria, e.g., high blood pressure, fat around the midsection, increase (from left to right on the chart above), LDL-C (the blue bars) doesn’t really go up a lot, but LDL-P (red bars) trends obviously upward as more metabolic syndrome criteria are met. Again, it’s particles particles particles, not cholesterol cholesterol cholesterol. The above excerpt is from a 1992 article, and is one of thousands that explore the link between stress and cholesterol levels. I’ve included the link mainly to demonstrate that this information was being explored in the scientific literature decades ago. This article by Dr. Emily Deans, is titled Stress Is Metabolic Syndrome. Her point is clear enough. Dr. Deans is a psychiatrist who writes some interesting posts. It’s worth a look, as virtually everyone underestimates the devastating impact that stress has on their life and health. A point worthy of consideration is that concordant and discordant values are in reference to LDL-C. In other words, LDL-P is considered to be either concordant or discordant in relation to LDL-C. I find it fascinating that rather than scrapping the notion that LDL-C is the prognostic indicator of all things CVD, a statue was instead erected in its honor and the marker with real prognostic value, LDL-P, is said to be either concordant or discordant in relation to the marker that’s not actually accurate. This can shed light on the fact that changing something so big as medical practice and public perception isn’t a cut and dried event, but rather a long process. You probably noticed that the focus regarding risk status for atherosclerosis, heart attack, etc., focuses on LDL-P; there’s really no mention of HDL. As I mentioned before, we’ll have another look at HDL, but it’s true: HDL isn’t as prognostic a marker as is LDL-P, but it’s still helpful. We’ve learned that the number of particles required to transport cholesterol and TG is a very important diagnostic marker. We’ve also discussed that as lipoprotein particles transport, deliver and pick up their goods, they either decrease or increase in size. By measuring the number of the various particles and factoring in their size, it’s possible to arrive at prognostic markers that can potentially tell us even more than just measuring LDL-P per se. Specifically, LDL-P can tell us about CVD, while it’s possible to portend the development of metabolic syndrome well before observable symptoms appear, e.g., abdominal obesity and insulin resistance. By measuring the numbers and sizes of various particles, the early warning system we’ve been searching for is found. When things are humming along smoothly with your health, you’re unlikely to be developing metabolic syndrome, NAFLD, adrenal fatigue, leaky gut and so forth. But if things aren’t going along so well, you’re probably developing these issues and more. And part and parcel of developing the signs and markers of health problems is an alteration of the number, size and density of the lipoprotein particles required to traffic cholesterol and TG. It stands to reason that when we chronically overfeed on the wrong ratios of macronutrients and/or stress ourselves as a matter of habit, our lipoproteins, i.e., chylomicrons, LDL, HDL VLDL, IDL and Lp(a) will be adversely affected. VLDL will be created in greater numbers to traffic TG from the liver to the periphery due to de novo lipogenesis, which will in turn lead to greater numbers of LDL-P, as they’re created from VLDL particles that aren’t eliminated by the liver. A reduction in the overall size of LDL-P per se (there’s a range of particle sizes, and when LDL’s tend to be smaller overall, it’s a sign of metabolic syndrome and CVD risk). We’ll revisit this topic and review where you can get labs done that include these values.